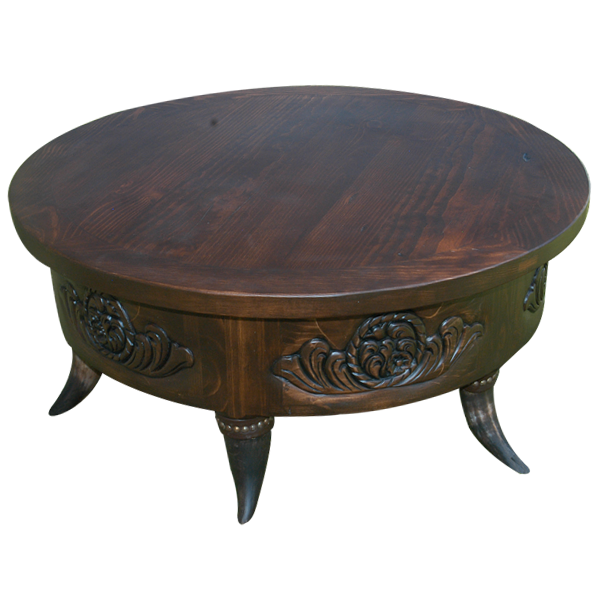 Add elegance to your Western décor with this luxurious, handcrafted, Western style coffee table. The coffee table features a circular top with a classic, clear top rim. The base is also circular, and the base is embellished with hand carved, floral designs that encircle the entire coffee table. The coffee table rest on five, sturdy, inverted steer horn supports, and the base of each horn is adorned with hand tacked, gilt nails. The coffee table has an elegant, mahogany finish, and it is made with the best, sustainable, solid wood available. It is 100% customizable.